Like many preppers, I carry a small backpack with me everywhere I go. It’s in the back seat when I run to the supermarket or to the office. It’s on my back when I take a hike through the woods. I don’t go anywhere without it. Call it my security blanket; just having it brings a sense of comfort. In it, I carry my just-in-case supplies. I have my survival kit, my first aid kit, my survival knife, some homemade MRE’s, rain gear, and an assortment of other items that I may need in case of an emergency. Whether I’m stranded on the side of the road or lost in the woods while hiking, these items will help make my unplanned adventure much more pleasant. I’ll share the contents of the bag sometime in another article. There are a lot of prepper web sites that describe how to make a good bug-out-bag or get-home-bag. There are even entire books on the subject. Those resources are great places to start thinking about the contents of your bag. 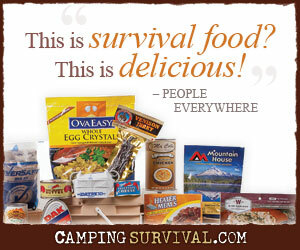 Sometimes new preppers will read through those lists and think that everyone should include everything on the list. If a little is good, a lot is better. But those resources are not the final word on the subject. You should customize and personalize your bag to meet your needs, not the needs of someone else. What I need in my pack will be different than what you may need in your’s. My experiences and knowledge are different that your’s. I’ll want to include items that augment my experiences and you’ll want to do the same. The scenarios that I’m preparing for may be different that what you are likely to experience in your life. I live in a rural community and my daily commute takes me down back roads. I also spend a fair amount of time in the woods hiking and camping. My bag is designed with that lifestyle in mind. If you live in an urban setting and ride the train to work each day, your bag will likely be different than mine. The gear that we choose to keep in our bags will be different based on our skills and our expected uses or possible needs for the bag. After you’ve put together your bag, it’s important to test it. It’s only through a simulated emergency that you’ll truly discover items that are missing from your supplies. You’ll also identify items that you don’t need to carry, that are providing little benefit but are adding weight an bulk to your bag. I like to test myself and my survival pack regularly. I hike into the woods a short ways, perhaps a 1/2 mile or so, carrying only my survival backpack. I usually make a debris hut, start a fire, and prepare to spend the evening in the woods using only the items in my pack. Since this is only a test, I usually have some additional supplies in my truck. If I truly need them, I can always hike the 1/2 mile out to the vehicle and get them. I try not to do that, but I have done it on occasion. Over this past weekend, I made one such outing. It went very well. Here are a few observations from my experiences that may help as you’re putting together a pack or planning a test. Emergency Thermal Blanket. Although I carry an emergency thermal blanket in my survival kit, I apparently don’t really know how to use it to keep warm. It was cold over the weekend, considerably colder than the meteorologists predicted and I tried to use my thermal blanket for warmth. It didn’t work. I’ll need to do some research on how to best use it. I’ll keep it in my gear for now since it has other purposes: signaling, rain catch, waterproofing a shelter, etc. Insulate the Shelter and then Add More Insulation. As I shared in 5 Tips to Improve Your Cold Weather Shelter, smaller shelters are better when it’s cold. Your body heat can warm a smaller shelter and keep you warm. However, it’s very important to make sure the shelter is insulated very well. Add a good layer of leaves to your shelter and when you think you have added enough, add twice that much. Cedar Boughs are Good Insulation from the Ground. The earth will steal much needed heat from your body if you lie directly on the ground. A good layer of insulation is needed to keep you off the ground and away from the earth. A thick layer of cedar boughs works well for this. Speed Kills. When building a shelter in cold weather, work at a slow and steady pace, taking breaks as frequently as need to cool down. Strip off layers of clothing to help regulate your body heat and prevent perspiration. Sweat will wet your clothes and make you that much colder in the middle of the night. Overall, my last test went very well. As I improve my skills and my knowledge increases, I’ll continue to test myself and the gear I’ve selected for my survival pack. As they say, Perfect Practice Makes Perfect. Have you had to rely on your pack? What do you wish you’d known beforehand? Do We Have What It Takes to Survival TEOTWAWKI? Thanks Jarhead, I’ve enjoyed reading about your tests on SHTFBlog.com. I think I’m going to keep the thermal blanket in my kit but will probably add a wool blanket too. Yeah, the space blankets are meant more to keep you alive, not necessarily to keep you “warm”. Excellent article and makes me want to get out and test my own bag in this same way. I have carried both the thin cheap space blanket and thinner orange and sliver blanket that makes into a bag. Using both a lightweight tarp or garbage bags, I have duct taped the silver blanket to the inside to reflect heat down on me, or to reflect the fire’s heat back towards my back. I also keep several hand warmers in my day pack. Good idea, Joe. I was thinking about that this past weekend. My shelter was a slanted A-Frame with a fire not too far from the opening. Next time, I may shift where the door is and use the thermal blanket to reflect the heat back down to me. We’ll see. If you dig a small pit for a small fire you can rap the survival blanket around you and the fire to keep you warm . You can use a wool blanket too for this with two poles to keep from burning your blanket . Just remember to let the fire burn down a bit before you rap you and your fire in plastic you are trying to get warm not burned . I think the russians will get you before you can get to a safe area to hide out,MAYBE you better be carrying an AK-47 with lots and lots of ammo for it in your truck too…………….